Written by Janet Choi on April 23, 2015 . “Hello. My name is Inigo Montoya. You killed my father. 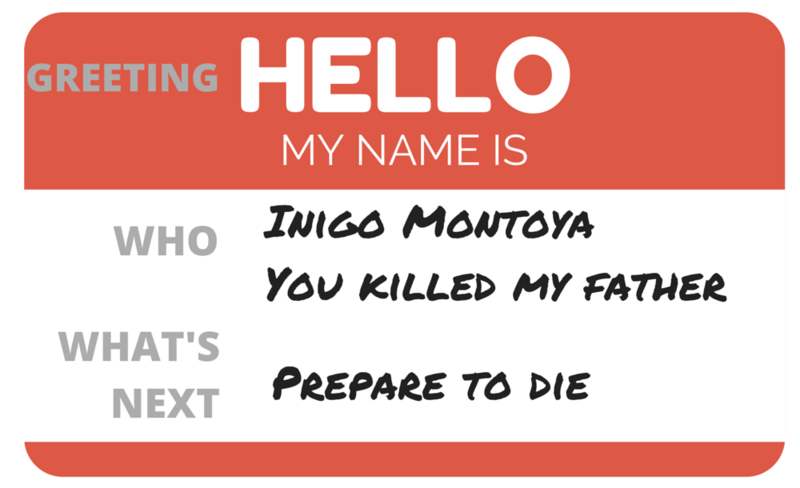 Prepare to die.” You might not realize it, but this famous quote from the Spanish swordsman in The Princess Bride has all the ingredients you need to make great welcome emails. Prepare to die. — What comes next. Let’s examine the 3 elements of the welcome email, go through some ideas for what to say, and see how to tie it all together (without threats of revenge). The greeting is quick moment simply to say “hi” and “thanks.” This is the one spot governed by convention, so don’t think too hard about the basic social act of acknowledging other human beings — “hello” or “welcome” will do just fine. Follow through with an indication of happiness or gratitude that someone expressed enough interest to grant you entrance into their inbox. We’re happy, glad, excited, thrilled, delighted that you joined our app! Thanks for subscribing/signing up for our list! Gain your advantage by breaking away from the generic. Add some specificity. Personalize using first names and other relevant details — and make the reader feel special or part of something larger than themselves. Thanks for joining our newsletter community of thousands of people who love email! It’s exciting that you’re one step closer to mastering how to play the ukulele! 2. Who are you (and why is that important)? GetFeedback makes it easy to create mobile-ready surveys. We started Karma with one simple idea: everyone should be able to get online, everywhere they go. 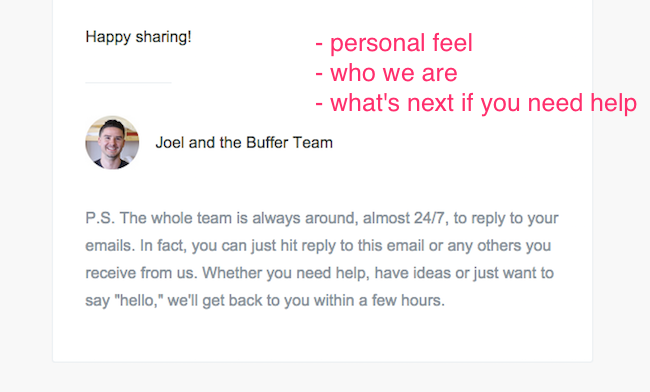 The final component of the welcome email is to build trust by setting up expectations and move readers towards your goals with clarity around what to do next. What’s going to happen after this welcome conversation? 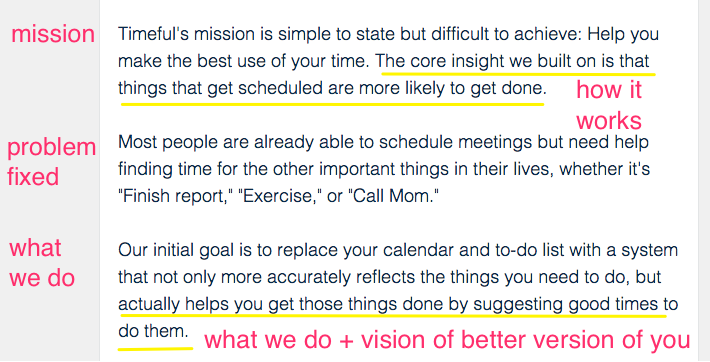 Newsletter welcomes often describe what type of content and frequency to expect. Grubhub’s welcome email explains that subscribers will get discounts, prizes, and restaurant recommendations. Are there multiple tasks that will help someone get started or activated? 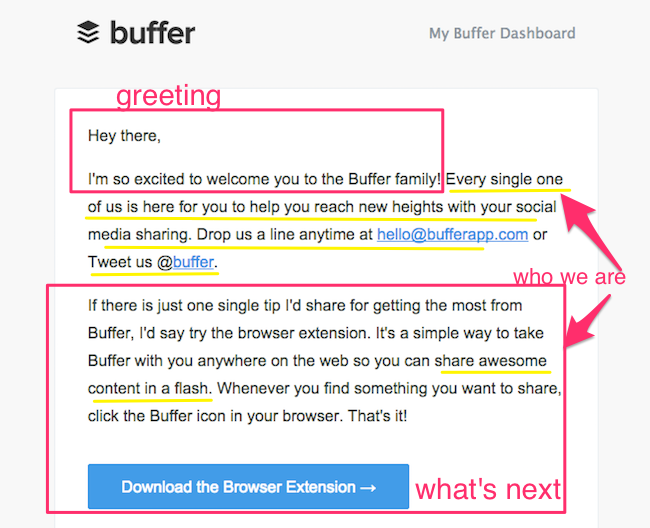 Split up your welcome emails into a drip series. Getting the most out of an app or site doesn’t mean you have to stuff all that most-ness into one email Finally, inform your new signups that they’re in good hands if they need help with any questions or concerns that come up. Be clear about how to get in touch, whether that’s a support site, email, or phone number. If you require assistance, have a question, or would like to suggest new features, please visit Todoist Support at https://todoist.com/Support. We’re happy to help you anytime! We’re here to help. If you have any questions about getting started, setting up your first automation, or saving time with Zapier, just reply to this email. Our friendly support staff will point you in the right direction, free of charge. Gilt‘s welcome email is straightforward, quickly setting expectations of how its emails and sales work and getting you to browse and shop right away. 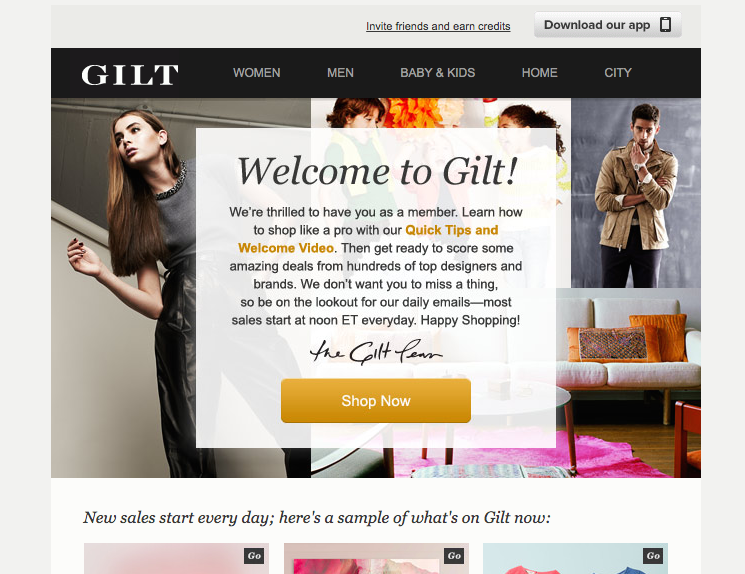 Greeting: Welcome to Gilt! We’re thrilled to have you as a member. What comes next: be on the lookout for our daily emails — most sales start at noon ET every day. SHOP NOW. 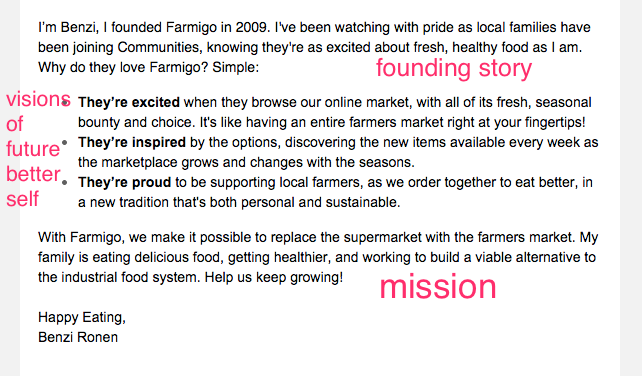 Farmigo is an online farmers’ market that delivers locally grown and produced food directly to your community. It’s all about the farm-to-neighborhood connection. Greeting: Dear Janet, Thanks for joining Farmigo! Clearly you’re someone who loves delicious, fresh-from-the-farm food, and we’re happy to offer you a new way to get it. The greeting here does a great job of making me feel part of the local food movement, enriching my sense of self-identity — which starts creating emotional affinity for a company I’ve just met. Here the what comes next is brought to the forefront. The service involves a fair amount of logistics so the email makes clear what I have to do to get my first (incentivized!) order delivered and where to pick it up. Who you are: Finally, the last part of the email explains Farmigo’s origin story, mission, and values all while connecting to a certain community of people and tapping into powerful emotions like excitement, inspiration, and pride. Shoeboxed is a tool for scanning, organizing, and keeping track of receipts and expenses for reports and taxes. Unlike Farmigo, Shoeboxed’s welcome email is extremely succinct but it includes all the necessary elements. 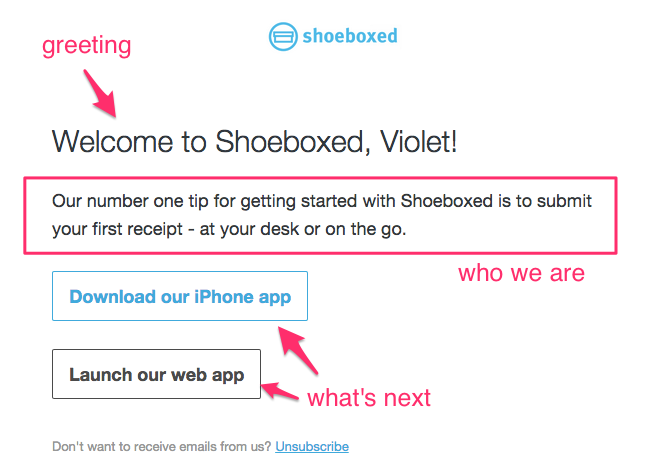 Personalized Greeting: Welcome to Shoeboxed, Violet! Who you are: This part might have used some beefing up, but you get an idea of what Shoeboxed does because they encourage you to submit receipts. What comes next: The best way to get started is to download the mobile app or launch the web app. 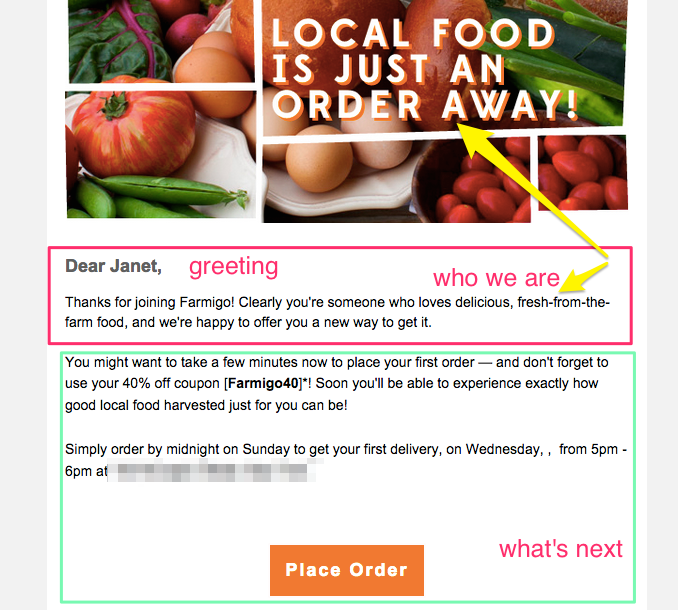 Don’t make your welcome email sound like an impersonal, automatic form letter. Otherwise, you’re wasting an opportunity to continue making your pitch to a willing audience and saying something to be remembered by. Submit your welcome email(s) to janet[at]customer[dot]io for a free, friendly critique! Liked this post? Check out 5 Keys to Welcome Emails that Make Rewarding First Impressions or 5 Valuable Templates to Optimize Your Welcome Emails.